Business Graph PowerPoint Templates And PowerPoint Themes 1012-The PowerPoint Template shows the Growing Bar Graph reaching its Destination that is Globe. This template portrays the concepts of winning leadership Finance Success competition sports business shapes people and abstract. You can use this template to illustrate Global Issues. An excellent graphic to attract the attention of your audience to improve earnings.-Business Graph PowerPoint Templates And PowerPoint Themes 1012-This PowerPoint template can be used for presentations relating to-"Business graph with earth, marketing, finance, business, success, money" Escape from the humdrum with our Business Graph PowerPoint Templates And PowerPoint Themes 1012. Put in the element of excitement in your talk. 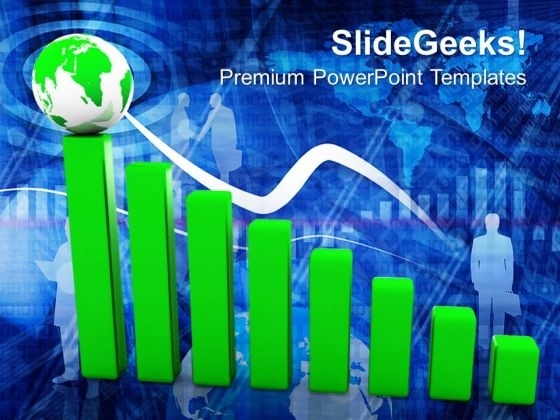 Grab the attention of your audience with our Business Graph PowerPoint Templates And PowerPoint Themes 1012. Just download, type and present.